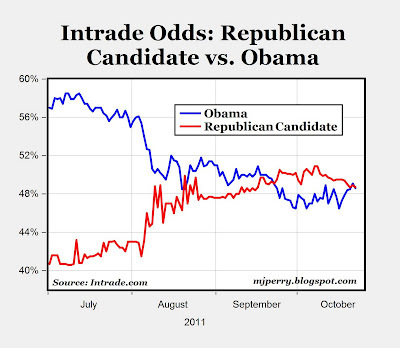 Current Intrade odds for the 2012 election: Obama (48.6%) vs. any Republican candidate (48.7%), basically a "dead heat" (see chart). For other Intrade contracts: Bachmann is down to 1.2% (from 18% in July), Gingrich is up to 3% (from 1% a month ago), Herman Cain is steady at 7-8% for the last month, Perry is steady at 15% for the last 10 days but down from 35% a month ago, and Romney is still the front-runner holding steady at 67% and up from 35% a month ago. Pres. Obama has plenty of time. He's a strong campaigner. The media are on his side. It'll be tough to unseat him. Which public is supporting the Kenyan Kommie Klown rufus and what are those alledged issues? Apparently the any candidate means any candidate other than the ones we have. "Apparently the any candidate means any candidate other than the ones we have." No, any candidate means any candidate. 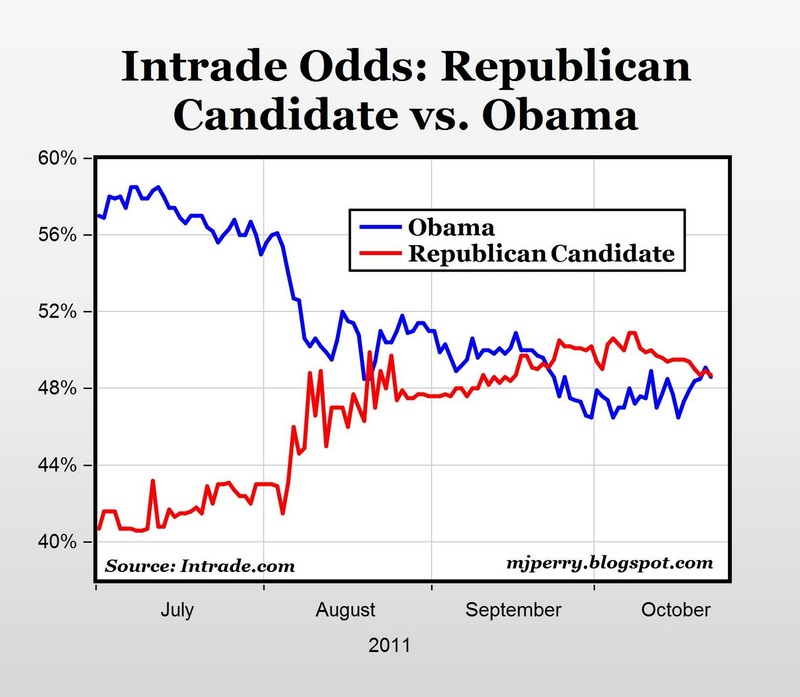 A candidate only needs to run as "NotObama" to be a contender. I can see the signs waving now: "Our Candidate _____________(fill in the blank) is NOTOBAMA". The "Bismarck Boom": Lowest Jobless Rate in U.S.